Enjoy this Baby Shower Cake at your next baby shower. 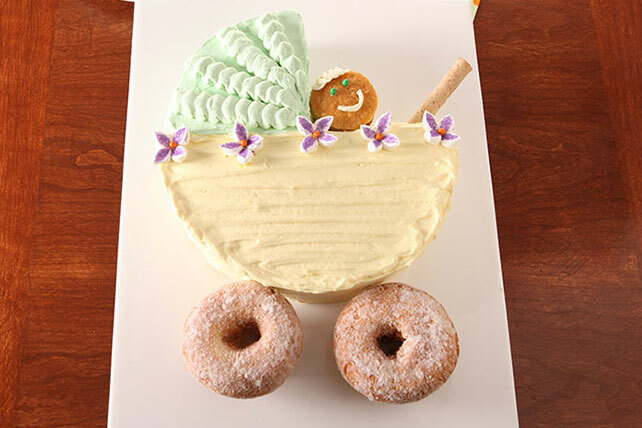 Donuts, cookies and pudding make this delicious carriage-shaped cake perfect for celebrations. Remove cake from pan. Cut into pieces as shown in Diagram 1; arrange on tray or large platter as shown in Diagram 2. Click here for Diagrams. Reserve cake trimmings for later use. Beat pudding mix and milk in large bowl with whisk 2 min. Stir in COOL WHIP. Reserve about 1/4 tsp. icing. Tint 1-1/2 cups of the remaining icing with green food coloring; spread onto top and sides of carriage hood. Tint remaining icing with yellow food coloring; spread onto carriage bottom. Place donuts at base of carriage for the wheels. Insert pirouette cookie into cake for the carriage handle. Use kitchen shears to cut each marshmallow diagonally in half; press cut sides into sugar. Arrange in groups of 4 on top of cake to make 5 flowers; place 1 candy in center of each. Use 2-inch cookie cutter to cut 1 round from cake trimmings; discard remaining trimmings or reserve for snacking. Decorate cake round with reserved icing and add to carriage as shown in photo. You can make this cake using any combination of colors and decorations, such as piped frosting, gumdrops and/or jellybeans. Prepare using your favorite flavor of cake mix. Most cake mixes make 2 (8- or 9-inch) round cake layers. This recipe only uses 1 cake so reserve the remaining cake for another use.